This was wildly unusual. And I like that! The city of Athanor is a lot like what Australia had been – a place to send criminals. And while the criminals sent to Athanor were typically political exiles that criminal element has taken the city and turned it into one of the seediest, most violent communities. Gang warfare abounds as exiles have little choice but to pick a ‘side’ and fight for their own survival. Most would leave Athanor if they could, but the city is unique as a prison…. Once, alchemists, known as The Curious Men, set the city adrift in both space and time. Now it drifts in a nether-where, adding cultures with new citizens and turning the city into a vast maze of reprobates. Isten stands alongside her gang, all of them starved and fighting for scraps, and dreaming of a way out of Athanor. It is only when she hits rock bottom that she realizes that no one is going to come to her rescue and that if there is any chance to change the criminal culture of Athanor, she might be the one who has to make the change! This is world-building at its finest. Author Darius Hinks has managed to do something that few sci-fi authors seem capable of these days – create something new and fabulous. I knew early on that I was entering some uncharted territory and I felt a little as though I was entering Wonderland … a dark, frightening Wonderland. This penal colony – again, so very much like the origins of Australia as we know it – itself is a character in the book when we begin; there is history and future and conflict and danger. Isten is every hero/heroine of fantasy literature. She has choices to make and she holds the key to change – the conflict that makes drama necessary. Her heart and determination are key to making this book work and under the pen of Hinks, it works very well. I very much look forward to journeying here again (though it wraps so nicely I don’t know if that will happen)! Looking for a good book? 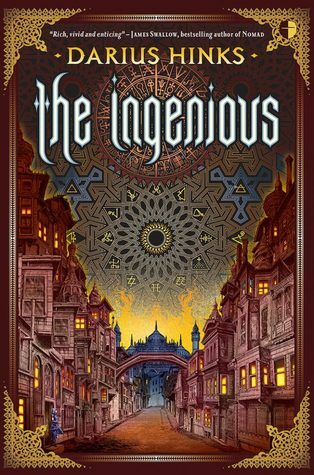 Darius Hinks’ novel The Ingenious is precisely what the title says it to be and for those who enjoy a strong, dark, slightly twisted fantasy with magic and wonder, this is a book to read.